The unmanned Russian supply ship Progress 47 failed to re-dock at the International Space Station during a docking system test on July 23, 2012. A robotic Russian cargo ship failed to dock at the International Space Station late Monday due to apparent failure in a new rendezvous system, NASA officials say. 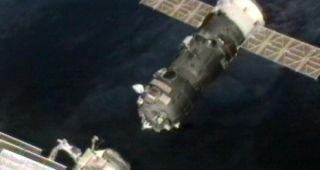 The Russian supply ship Progress 47 was testing Russia's new Kurs-NA docking system when the docking failure occurred. The unmanned spacecraft, which was already at the space station, undocked from the orbiting laboratory on Sunday (July 22) was expected to park itself at a docking port on the space station's Russian segment Monday at 9:57 p.m. EDT (0157 July 24 GMT). Instead, the spacecraft is awaiting its next chance to dock, which will come next Sunday, according to press reports. The Kurs-NA docking system is designed to be an upgraded version of the Kurs automated docking system that has been used for years by Russian spacecraft. The new system includes upgraded electronics and was expected to use less power and enhance safety. A passive abort is an automatic safeguard to protect the International Space Station from a malfunctioning spacecraft. It is designed to take a spacecraft away to a safe distance in the event of a failure. During Monday's failed orbital rendezvous, the Progress 47 spacecraft backed away to a point 1.8 miles below the space station and is awaiting its next docking attempt. Officials with Russia's Federal Space Agency said the next docking try won't occur until after the arrival of a new Japanese cargo ship, the H-2 Transfer Vehicle 3, which will arrive at the station on Friday (July 27). An unmanned Russian Progress 47 cargo ship is being used to test an upgraded automated docking system for the International Space Station. The Progress 47 spacecraft launched to the space station on April 20 and was expected to be intentionally destroyed on July 30 by burning up in the Earth's atmosphere over the Pacific Ocean. On Sunday, the supply ship undocked from its parking spot and flew to a waypoint 100 miles (160 kilometers) from the space station – a position it held for 24 hours before starting the Kurs-Na docking test. Progress 47 and the HTV-3 spacecraft are not the only unmanned cargo ships slated to arrive at the International Space Station. After the two spacecraft park at the orbiting lab, another unmanned Russian spacecraft, the Progress 48 supply ship, is due to launch toward the station. The Progress 48 spacecraft is currently scheduled to launch toward the space station on Aug. 1 from the Central Asian spaceport of Baikonur Cosmodrome in Kazakhstan. The unmanned spacecraft are part of an international fleet or robotic vehicles that deliver supplies to International Space Station's crew. The European Space Agency also has a large unmanned space cargo ship, the Automated Transfer Vehicle, and the private California-based firm Space Exploration Technologies (SpaceX) is expected to make the first official cargo delivery with its private Dragon space capsule later this year. The station is currently staffed by the six-person Expedition 32 crew, a team that includes three Russians, two Americans, and one Japanese astronaut.